Midgley Lodge Motel01924 830069work Guest AccommodationMidgley Lodge Motel overlooks the Pennines and is just a few miles from the city of Wakefield and the M1 motorway (jct 38/39). The luxurious bedrooms ALL enjoy a panoramic view across miles of open countryside Within the grounds of the motel there is a nine hole golf course with six par four's and three par three’s and The Fairways Bar which offers a wide selection of beer, wines, spirits and food. The motel is situated within the shared grounds of the Black Bull Inn, which offers an extensive selection throughout daytime and evening. This is the perfect setting for the family, traveller or business person to break a journey; located just a 5 minute drive from M1 at J38 / J39, 10 minutes into Wakefield/Barnsley and15 minutes to Leeds or Huddersfield. Single, double, twin or family rooms are available and all are exclusively decorated, are generous in size and have en suite bathrooms. Local places of interest include Yorkshire Sculpture Park, National Coal Mining Museum for England and National Trust Nostell Priory. Midgley Lodge Motel overlooks the Pennines and is just a few miles from the city of Wakefield and the M1 motorway (jct 38/39). 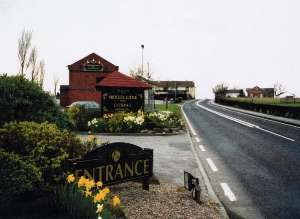 The hotel is located on the left and is visible from the road.